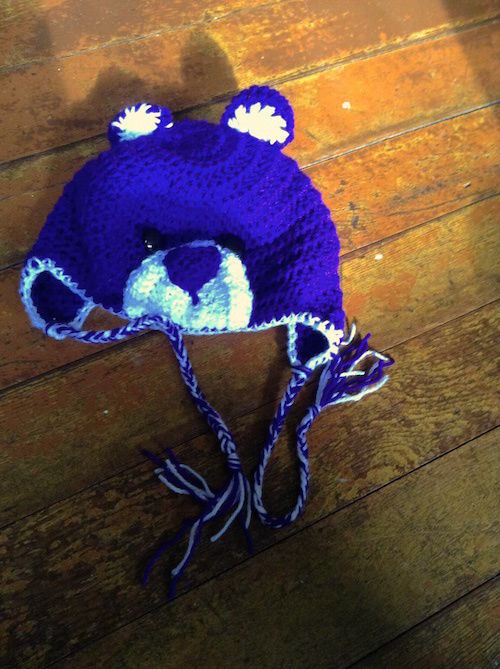 This is the second “Go Bears” hat … now, both the little grandkids will have a “mascot hat” for their Mom’s school. (Note: the hat really is purple… the camera didn’t want to pick up on the colour today for some reason). I do the ear flaps differently, however. 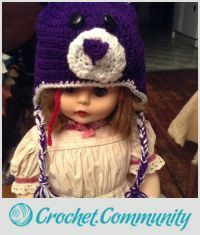 When I finish the hat itself, ending at the back of the hat, I slip stitch to the place that I want to add the earflap. Generally, the flap is 10-12 stitches wide and placed almost in the middle of the side of the hat. I do tend to put the flap more at the back than the front. So it looks something like this: slip stitch 8; dc 12 . (and that leaves 10 stitches to reach the front point of the hat). I then do the decreasing of the dc as stated in RepeatCrafterMe’s pattern. When I get to the end point, I slip stitch down the front of the flap, around the front of the hat and then do the second ear flap, again placing it at the same “stitch count” as the first one. When I complete that flap, I slip stitch down the back of the flap and around to the back/beginning. Now I change colours and single crochet around the entire hat, putting 3 sc in the tip points of each ear flap. These spots are where the fringe is attached. repeat above; finish off the white and stitch the ear to the hat (to the side of the hat’s magic ring). sew on two dark black buttons for eyes. My notes will help me with the next one I make…and anyone else who wants to give it a try. Hopefully if someone tries this, they will have improvements that they will share! I have very few young people to make hats for, but this one is so cute I may just give it a try and wait for someone to need it! PS. i find that when your camera doesn’t want to take the right colour, try doing the photo with no flash and or near a window during daytime hours…or if at night or dark cloudy days, tape a few pieces of white typing paper together to use as a background. the two wee ones wore their matching hats today. They looked so cute!